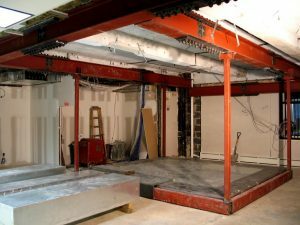 Even though we offer all types of vault solutions, with varying weight characteristics, not all building floors are structurally prepared to support the weight of such a structure. Therefore, when considering the type of vault to install on your premises (or prior to determining a new location for your operation), it is imperative to analyze the structural integrity of the site, since the cost to reinforce a floor can sometimes significantly increase the cost of the entire project. Please note that if the vault is to be located on a concrete slab on grade, this does not mean that there will be no structural issues to deal with. Clients have found that some of these floors were not as strong as originally assumed to be, requiring the contractor to cut out certain areas to insert footings and/or other means to support the weight of the vault. Over the past 30 years, we have come across structural challenges of all types where, in order to install a vault room, we collaborated with structural engineers and architects to design and install structural reinforcement not only to support the weight of the vault, but to fit into and work well with the surrounding office design. At all times, our objective is to minimize the cost for such reinforcement by attempting to design the vault to fit within the structural design of the building. For those intending to install vault rooms on new premises where structural reinforcement is going to be required, we recommend that the vault location be determined, if possible, based on the structural design of the floor. In this way, it is sometimes possible to reduce or even eliminate the cost for reinforcement should the vault be located directly over structural steel below. We therefore strongly recommend that you contact us prior to signing a lease so we can help you analyze the structural capability of the space you are considering. The engagement of a structural engineer at the same time to confirm this capability is imperative.